If you go to the earlier rounds of tennis at the US Open in New York City you can see a lot of great action on the smaller courts. It’s wonderful to be that close and on many occasions the matches are thrilling. The fans really get into them. 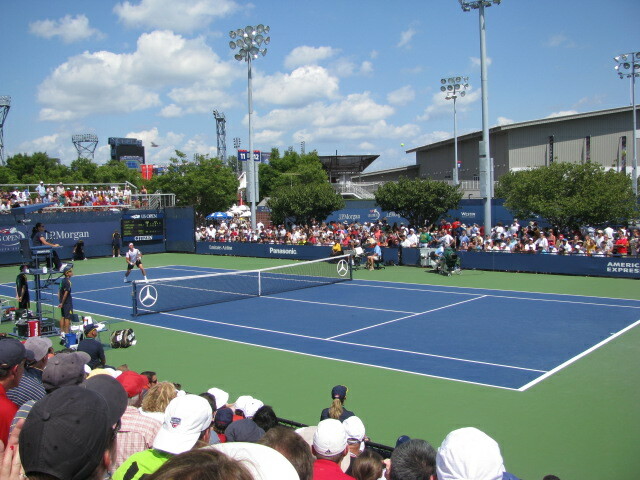 This entry was posted in Travel Photos and tagged 50 Year Project, Blog, Blogging, Flushing Meadows, Grounds at Flushing Meadows, Life, New York City, Photography, Queens, Sports, Tennis, Tennis courts, Travel, Travel Blog, Travel Journal, Travel Photo, US Open. Bookmark the permalink. NYC would love to have that weather now! Just wanted to return to say Hello! I’ve been to watch golf, but not tennis. It moves at a much faster pace, which is probably rather enjoyable. Cool shot! I’ve never been to a tennis match before. They are fun and when it’s a little slow I love to people watch!